Feel glamorous for your event in this BLACK gown which creates a trumpet silhouette, this Mon Cheri 216978 strapless Mikado dress has a pleated sweetheart neckline embellished with beading. The beading continues on the semi-open back. 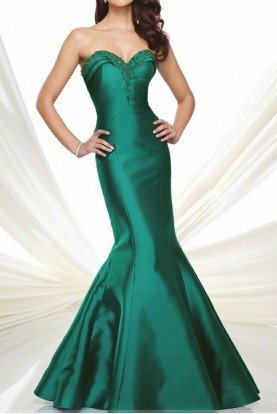 This gown features princess seams and the skirt finishes in a sweep train. Removable straps and a matching shawl are included. Disclaimer: The Picture above does show the green color however the dress is only available in BLACK.